I had travel plans this week. And in anticipation, I kept my vegetable and fresh fruit shopping to a minimum and tried to make use of whatever I had in the kitchen pantry and freezer. I usually keep cottage cheese/ Paneer and peas in my freezer for times when I’m out of ideas. But I shouldn’t make Paneer dishes sound uninspired. 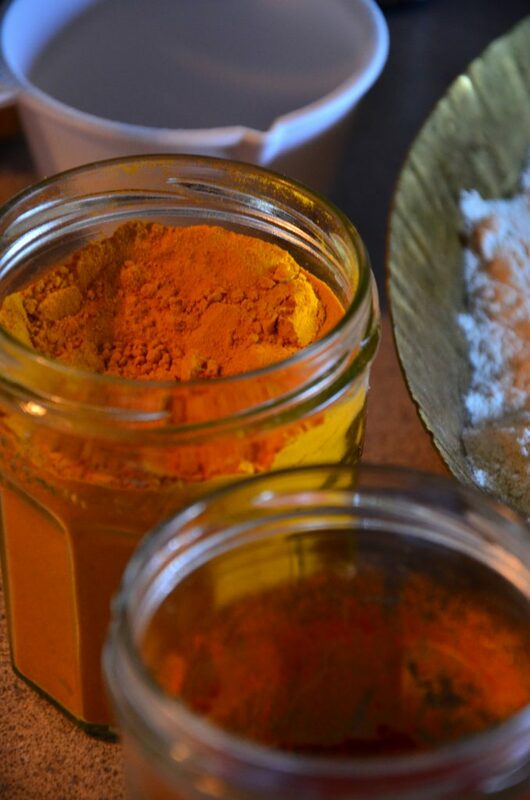 It is something that works well in various forms and definitely lends a certain richness to a meal. 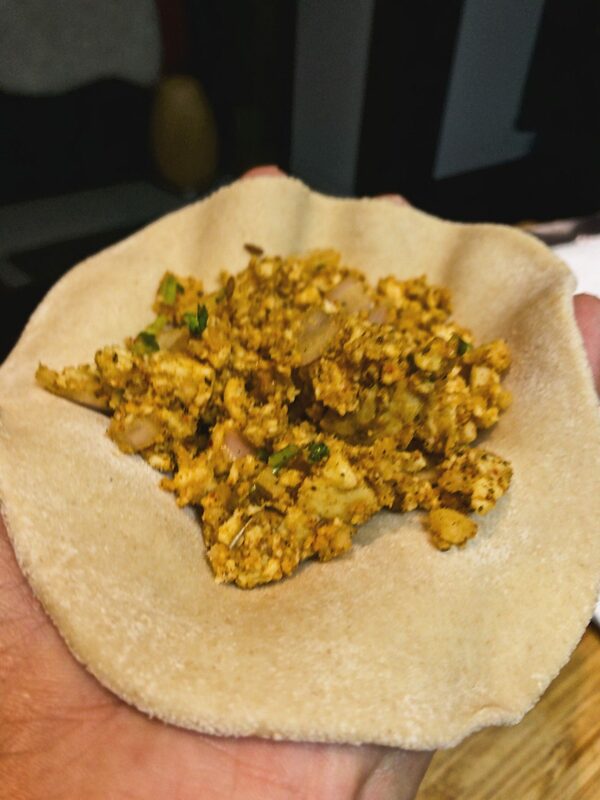 So in an attempt to use what I had: frozen paneer, one boiled potato, an onion, leftover coriander leaves etc, I decided to make some paneer parathas! I served them with some hari chutney, butter and yogurt. 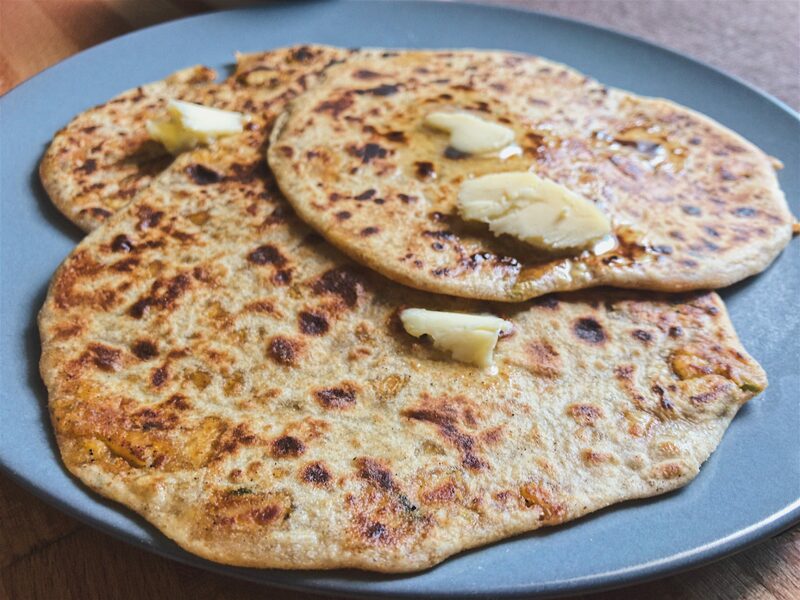 Since it is raining in most places in India and incidentally also in Boston where Kanika is, I thought it would be nice to share parathas that are best enjoyed in this weather with some steaming cups of chai! 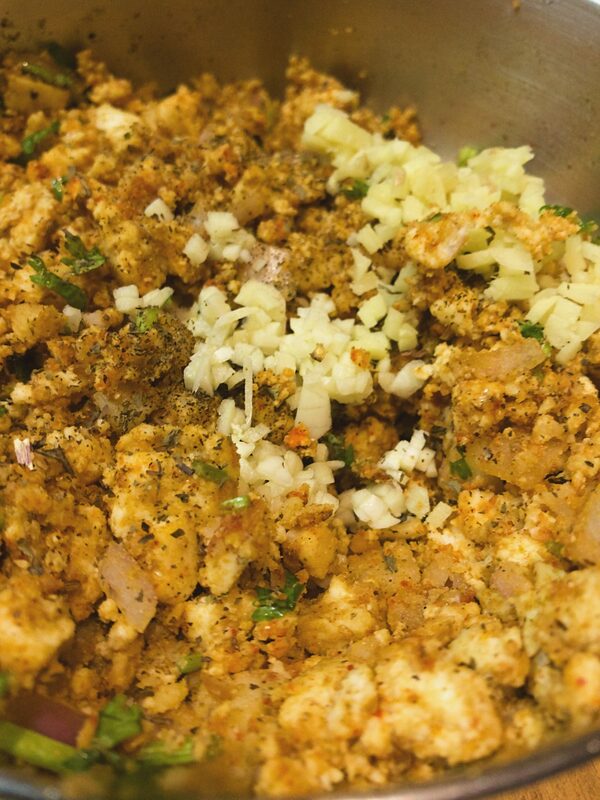 Start with preparing the dough so that it can rest while the stuffing mix is prepared. Mix the salt and flour together and add water to make a soft but not sticky dough. Mix nicely and add the water slowly so that the dough is not runny. The perfect dough for chapati or paratha is the one that is not too tough to pull. 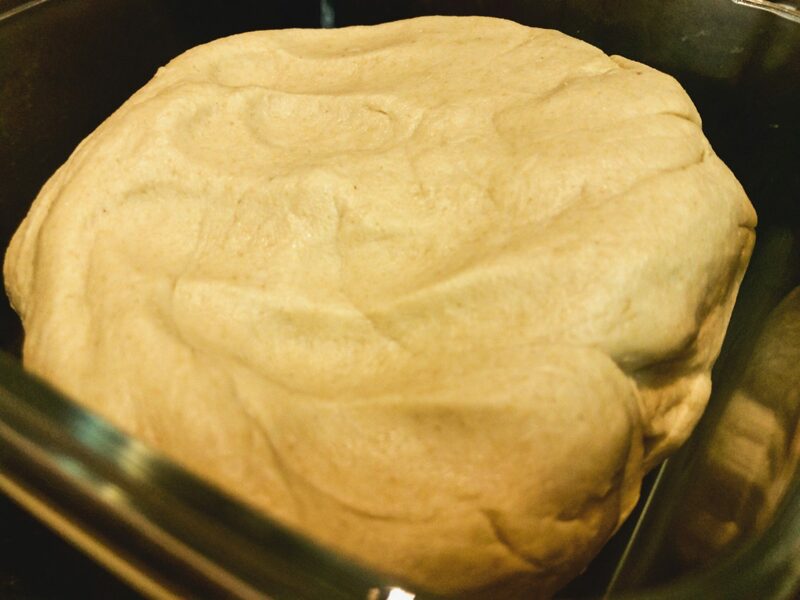 A tougher dough is usually prepared for making Pooris. 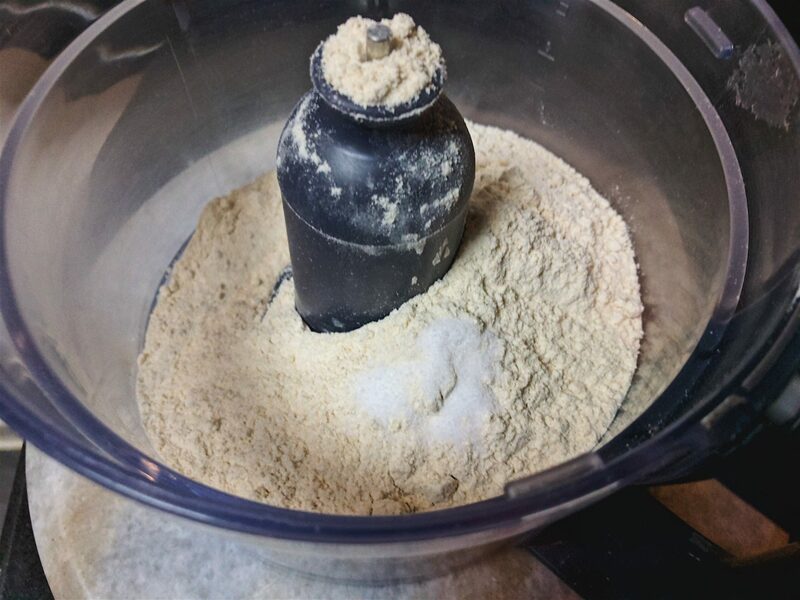 Incase you choose to use a food processor like me, just add the flour and salt and add water slowly from the feeder tube as the machine runs. Process till the dough forms a ball that moves freely in the jar. Once the dough becomes the right consistency, dab a few drops of cooking oil, cover and let the dough rest. 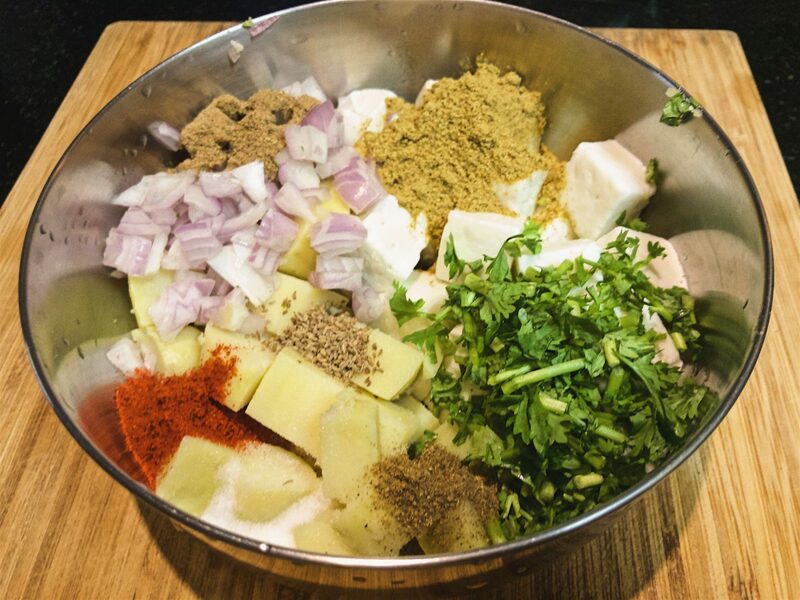 In a big bowl, add boiled potato, paneer and all the other ingredients and mix well. You can use your hands to mash and mix everything nicely. 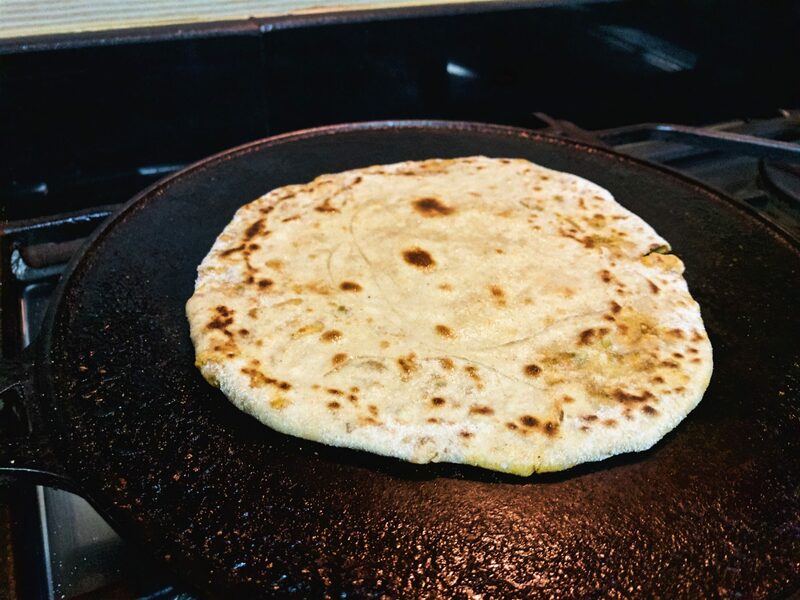 To start with making the actual parathas, place a tava (griddle) on medium high heat. 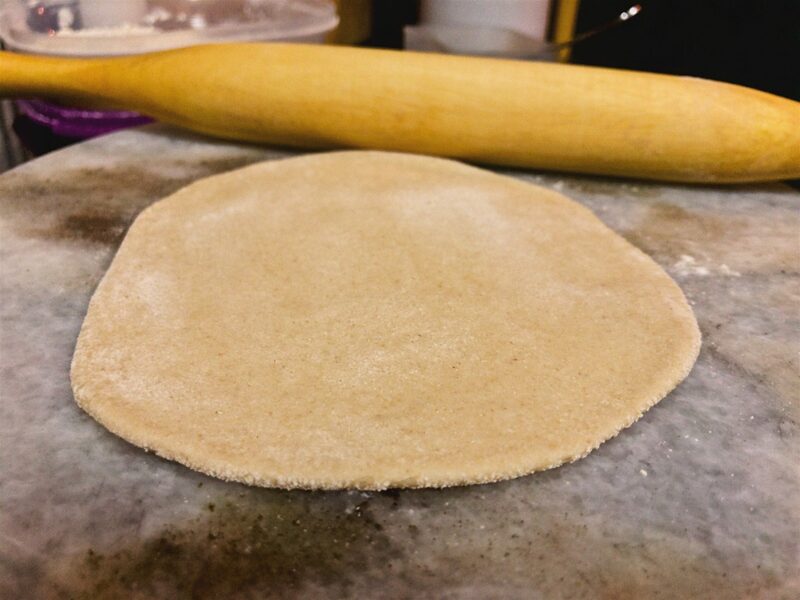 Pull out a rough ball of dough and roll into a small circle using some dry flour. Place this circular dough in your hand and with a spoon, add 1-2 spoons of the filling in the middle. Don’t over stuff! 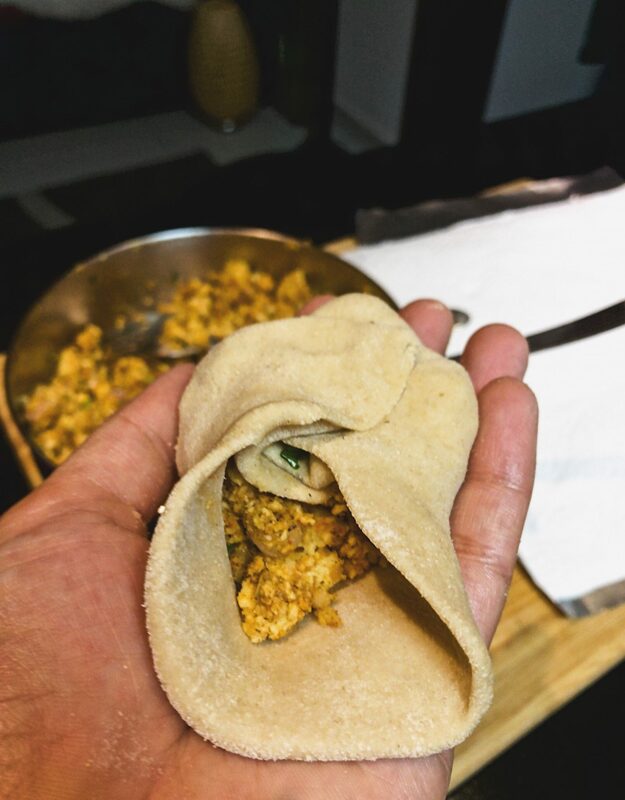 Start twisting and sealing the ends of the dough to make a stuffed ball, like shown in the picture. 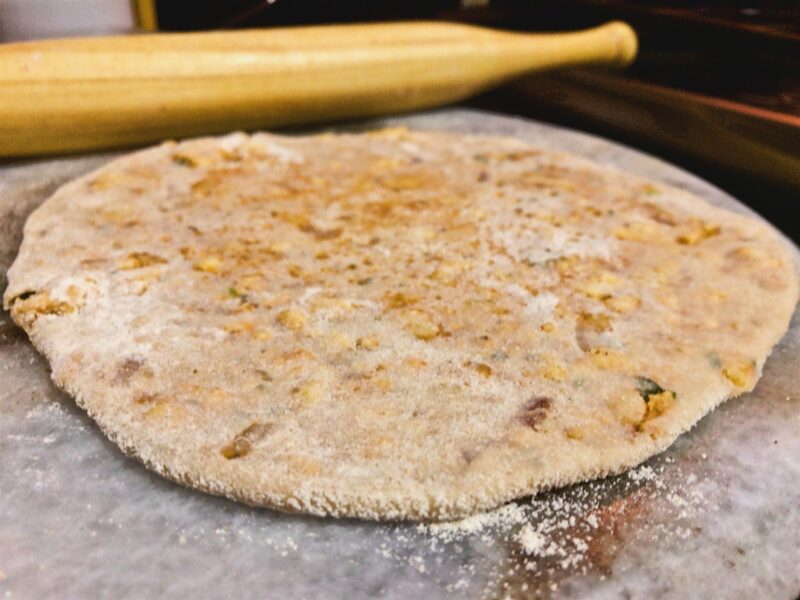 Coat the ball with some dry flour and roll gently while rotating to make the dough flatter. The shape doesn’t matter too much, as long as it is flattened without breaking apart too much- when that happens the filling tends to ooze out and stick to the work surface. An evenly rolled ball with cook better. 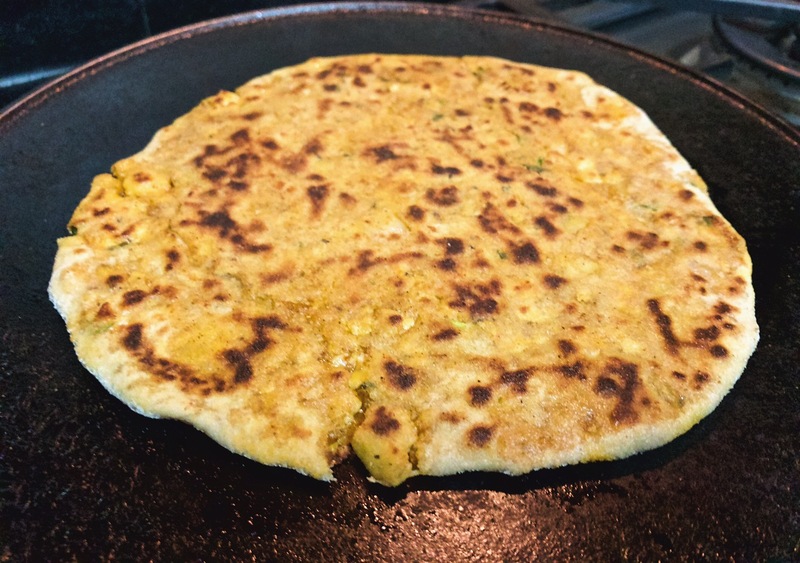 Gently lift the paratha and lay on the heated tawa. Cooking both sides evenly using a bit of cooking oil of your choice. 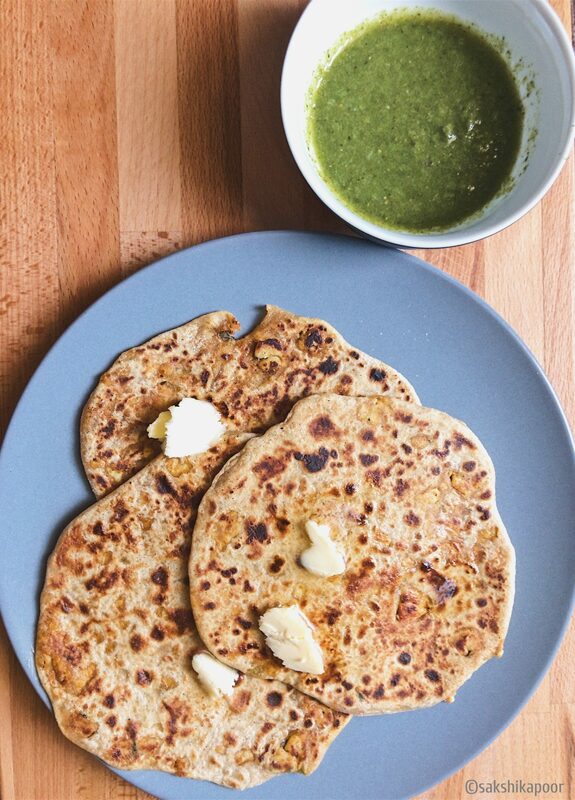 Serve with yogurt, butter, pickle or a chutney of your choice.